My husband and I bought our nephew a big dozer for his second birthday. Turned out to be a hit since it had buttons he could push that made noises. I hear he even wanted to take a bath with it the first night! A special boy needs a special card. I pulled out my old boy stamp from Hero Arts and combined it with a boy paper pack from Sandylions sticker designs. The trucks behind the boy are a sticker strip and a large truck is stuck inside. 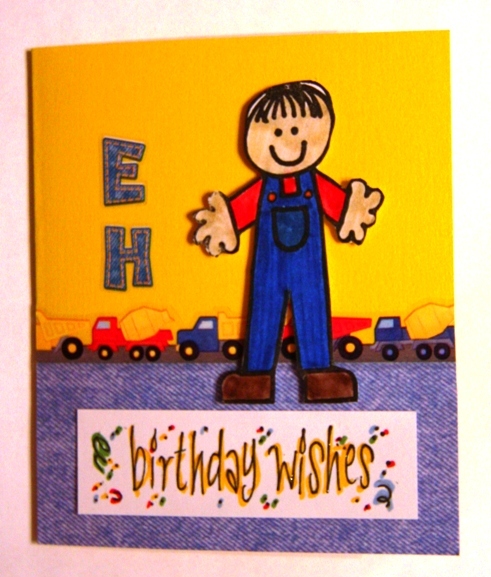 My nephew’s initials are E.H., which makes this a personalized card. The jeans paper below the boy ended up looking like carpet, but that’s ok. Inside I wrote, “May this help you move mountains.” I’m afraid the buttons and noises have him transfixed at the moment. The mountains will have to wait!